A couple of times in my life, I have found myself in situations so awkward, that I knew no amount of explanation was going to get me out of them unscathed. Alas, one of those happened just last week. 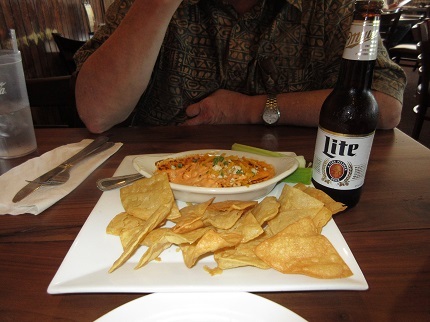 We found ourselves with a fairly quiet Friday, and decided we would celebrate by going out to lunch. It was our first lunch date in a long time, because I’d been sick and because we’d had company, and because all sorts of other things had intervened. Needless to say, we were having ourselves a whale of a good time enjoying our drinks and waiting for our appetizer to arrive. At long last our appetizer arrived and I had just taken a picture of it, when lo and behold an old acquaintance of ours stopped by our table to say hello. Brent Wells used to be a counselor in our bishopric, but he and his family had moved about twenty miles west of us. He had been a bishop and a high councilor, but was currently working in the scouting program of the Church in his neck of the woods. Because church is what ties us together, we talked about churchy things. We wondered how long the Church is going to be affiliated with the Boy Scouts, now that the Boy Scouts are hiking away from traditional family values. We talked about Brent’s youngest son, who is off serving as a missionary in Brazil. Brent asked if Fluffy and I were still serving as temple workers, and I assured him that yes, indeed, we are going to be going back there as soon as the temple reopens after it gets a new roof put on it and a new air-conditioning system and new seats in many of the rooms. The projected re-opening date is October 5. As we were visiting with Brent, it was fun to watch his eyes, because it was obvious he was trying to avoid looking at the open beer bottle on the table. But like bees to honey, we would catch him stealing a quick glance, and then quickly looking away. We could almost hear his thoughts. "Is that really a beer bottle on the table?" "Maybe they are no longer practicing Mormons and just are too embarrassed to say anything." "Or maybe they have this one little vice, and here I caught them in a pretty embarrassing situation." The beer that almost gave our friend Brent a heart attack. We talked and laughed about this on the way home, and we couldn't help but empathize with our friend. After all, if the tables were turned and we had caught some Mormon friends in the same situation, what would we think? Would there be any legitimate reason for a group of card-carrying Mormons to be sitting with an open bottle of beer on the table? We couldn't think of many (if any) legitimate situations. But actually, I have found myself with beer on the table in a public place for two completely different reasons. Both times, I was completely innocent — or as innocent as Kathy ever gets. The first time must have been twenty years ago. Janece Ford, who at that time was my saintly Relief Society president, was sharing lunch with me at a local restaurant. We were just deciding whether to order dessert when, to our utter horror, the waiter brought over a big, foaming glass of beer. Two evil women who shall remain nameless (because you know who you are, Sandi Berrett and Holly Davis) had ordered a beer to be sent over to our table. As we looked at the yeasty head on the beer, Janece and I could only mourn because they had not sent us something that was chocolate. What I should have done was to take a big swig of beer, just to shock them. Instead I think we gave the beer to the server, to augment his already handsome tip. On this occasion, though, the beer was on our table for a much more pedestrian reason. Fluffy and I were on a secret shopping assignment, and the beer was an assigned purchase. We have had to buy beer so often now that I forgot it was even on the table. It was only Fluffy who caught Brent’s horrified glances and realized he needed to defuse the situation. In case you are wondering what we do with the beer we purchase, this is how we dispose of it. We buy beer in a dark bottle rather than a glass. That way people from across the room do not know that we haven’t consumed even a drop of it. 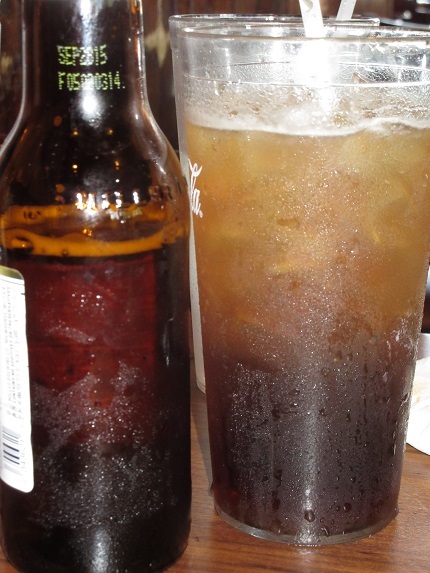 The beer poured into the glass leaves a concoction that looks like a watered-down soft drink. Problem solved. If Fluffy had been as oblivious as I had been, poor Brent probably would have gone home and told his wife that Fluffy and I were beer-drinkers. It would have been an obvious conclusion, but it would have been a wrong one. In Brent’s eyes, it was so obvious that we were drinking that beer. The bottle was sitting right there between us, and there was nobody else at the table. What other conclusion could he honestly reach? But even then, his own eyes would have lied to him. If Brent’s eyes lied to him about something that was so obviously black and white, how often do our own eyes lie to us about other things? How often do I look at things and make snap judgments about people and situations? How often do I decide that people have acted foolishly or even sinned based on something I have seen or heard or even inferred? How often am I wrong? The older I get, the happier I am that I am not responsible for the judgment of others. It is hard enough for me to figure out what my own motives were for doing something. There is no way I can judge my next-door neighbor or my errant friend, or even the lady in the Relief Society whose pot looks suspiciously like the pot I’ve been missing for the past six months. But as for judging, that is best left for the Judge of Israel. I have learned not to believe my own eyes. Not even when there’s a stinky bottle of beer on the table to tell me that something is rotten in Denmark.